These batteries are Suitable for low drain gadgets like CD Player,Torch,Toy,Personal Stereo,FM Radio etc.It can be Rechargeable upto 1000 times.These batteries are made of Nickle-Metal Hydride i.e. NiMH which is Eco-friendly. 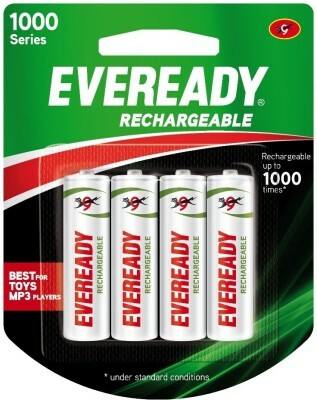 To Recieve updates and possible rewards for Eveready AA NiMh Ultima 1000 please sign in. To Recieve updates and possible rewards for Rechargeable Battery please sign in.